Copyright © 2003-2019, All Rights Reserved. Reading of UTF-8 and UTF-16 and writing of UTF-8 encoded XML files and strings. Data is stored in a linked-list tree structure, preserving the XML data hierarchy. SAX (streamed) reading of XML files and strings to minimize memory usage. Supports arbitrary element names, attributes, and attribute values with no preset limits, just available memory. Supports integer, real, opaque ("cdata"), and text data types in "leaf" nodes. Functions for creating and managing trees of data. "Find" and "walk" functions for easily locating and navigating trees of data. Mini-XML doesn't do validation or other types of processing on the data based upon schema files or other sources of definition information. It's bad enough that we require libxml2, but rolling our own XML parser is a bit more than we can handle. Given the limited scope of what you use in XML, it should be trivial to code a mini-XML API in a few hundred lines of code. I took my own challenge and coded furiously for two days to produced the initial public release of Mini-XML, total lines of code: 696. Robert promptly integrated Mini-XML into Gutenprint and removed libxml2. Thanks to lots of feedback and support from various developers, Mini-XML has evolved since then to provide a more complete XML implementation and now stands at a whopping 4,186 lines of code, compared to 196,141 lines of code for libxml2 version 2.9.9. The Mini-XML home page can be found at https://www.msweet.org/mxml. From there you can download the current version of Mini-XML, access the issue tracker, and find other resources. The Mini-XML library is copyright © 2003-2019 by Michael R Sweet and is provided under the Apache License Version 2.0 with an exception to allow linking against GPL2/LGPL2-only software. See the files "LICENSE" and "NOTICE" for more information. MXML_INTEGER_CALLBACK: All data nodes contain whitespace-separated integers. MXML_OPAQUE_CALLBACK: All data nodes contain opaque strings with whitespace preserved. MXML_REAL_CALLBACK - All data nodes contain whitespace-separated floating-point numbers. MXML_TEXT_CALLBACK - All data nodes contain whitespace-separated strings. You can provide your own callback functions for more complex XML documents. Your callback function will receive a pointer to the current element node and must return the value type of the immediate children for that element node: MXML_CUSTOM, MXML_INTEGER, MXML_OPAQUE, MXML_REAL, or MXML_TEXT. The function is called after the element and its attributes have been read, so you can look at the element name, attributes, and attribute values to determine the proper value type to return. Every piece of information in an XML file is stored in memory in "nodes". Nodes are defined by the mxml_node_t structure. Each node has a typed value, optional user data, a parent node, sibling nodes (previous and next), and potentially child nodes. where "-" is a pointer to the sibling node and "|" is a pointer to the first child or parent node. MXML_TEXT : A whitespace-delimited text (fragment) value. Note: CDATA, comment, and processing directive nodes are currently stored in memory as special elements. This will be changed in a future major release of Mini-XML. The resulting in-memory XML document can then be saved or processed just like one loaded from disk or a string. The last argument to the mxmlSave functions is a callback function which is used to automatically insert whitespace in an XML document. Your callback function will be called up to four times for each element node with a pointer to the node and a "where" value of MXML_WS_BEFORE_OPEN, MXML_WS_AFTER_OPEN, MXML_WS_BEFORE_CLOSE, or MXML_WS_AFTER_CLOSE. The callback function should return NULL if no whitespace should be added or the string to insert (spaces, tabs, carriage returns, and newlines) otherwise. You can also use reference counting to manage memory usage. The mxmlRetain and mxmlRelease functions increment and decrement a node's use count, respectively. When the use count goes to zero, mxmlRelease automatically calls mxmlDelete to actually free the memory used by the node tree. New nodes start with a use count of 1. Similarly, the mxmlGetElement function retrieves the comment string pointer for a node, which includes the surrounding "!--" and "--" characters. Whitespace-delimited text string (MXML_TEXT) nodes are created using the mxmlNewText and mxmlNewTextf functions. Each text node consists of a text string and (leading) whitespace flag value. 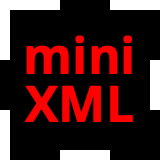 Mini-XML provides many functions for enumerating, searching, and indexing XML documents. MXML_NO_DESCEND: ignore child nodes in the element hierarchy, instead using siblings (same level) or parent nodes (above) until the top (root) node is reached. MXML_DESCEND_FIRST: start the search with the first child of the node, and then search siblings. You'll normally use this when iterating through direct children of a parent node, e.g. all of the "node" and "group" elements under the "?xml" parent node in the previous example. MXML_DESCEND: search child nodes first, then sibling nodes, and then parent nodes. The element and attr arguments control which elements are included in the index. If element is not NULL then only elements with the specified name are added to the index. Similarly, if attr is not NULL then only elements containing the specified attribute are added to the index. The nodes are sorted in the index. Mini-XML supports custom data types via per-thread load and save callbacks. Only a single set of callbacks can be active at any time for the current thread, however your callbacks can store additional information in order to support multiple custom data types as needed. The MXML_CUSTOM node type identifies custom data nodes. The mxmlGetCustom function retrieves the custom value pointer for a node. The function itself can return 0 on success or -1 if it is unable to decode the custom data or the data contains an error. Custom data nodes contain a void pointer to the allocated custom data for the node and a pointer to a destructor function which will free the custom data when the node is deleted. In this example, we use the standard free function since everything is contained in a single calloc'd block. Mini-XML supports an implementation of the Simple API for XML (SAX) which allows you to load and process an XML document as a stream of nodes. Aside from allowing you to process XML documents of any size, the Mini-XML implementation also allows you to retain portions of the document in memory for later processing. MXML_SAX_CDATA: CDATA was just read. MXML_SAX_COMMENT: A comment was just read. MXML_SAX_DATA: Data (custom, integer, opaque, real, or text) was just read. MXML_SAX_DIRECTIVE: A processing directive/instruction was just read. Add a node to a tree. Adds the specified node to the parent. If the child argument is not NULL, puts the new node before or after the specified child depending on the value of the where argument. If the child argument is NULL, puts the new node at the beginning of the child list (MXML_ADD_BEFORE) or at the end of the child list (MXML_ADD_AFTER). The constant MXML_ADD_TO_PARENT can be used to specify a NULL child pointer. Delete a node and all of its children. If the specified node has a parent, this function first removes the node from its parent using the mxmlRemove function. This function returns NULL if the node is not an element or the named attribute does not exist. Get an element attribute by index. The index ("idx") is 0-based. NULL is returned if the specified index is out of range. Get the number of element attributes. If the named attribute already exists, the value of the attribute is replaced by the new string value. The string value is copied into the element node. This function does nothing if the node is not an element. Set an attribute with a formatted value. If the named attribute already exists, the value of the attribute is replaced by the new formatted string. The formatted string value is copied into the element node. This function does nothing if the node is not an element. Add a callback to convert entities to Unicode. Get the name that corresponds to the character value. If val does not need to be represented by a named entity, NULL is returned. Get the character corresponding to a named entity. The entity name can also be a numeric constant. -1 is returned if the name is not known. The search is constrained by the name, attribute name, and value; any NULL names or values are treated as wildcards, so different kinds of searches can be implemented by looking for all elements of a given name or all elements with a specific attribute. The descend argument determines whether the search descends into child nodes; normally you will use MXML_DESCEND_FIRST for the initial search and MXML_NO_DESCEND to find additional direct descendents of the node. The top node argument constrains the search to a particular node's children. Find a node with the given path. The "path" is a slash-separated list of element names. The name "*" is considered a wildcard for one or more levels of elements. For example, "foo/one/two", "bar/two/one", "*/one", and so forth. The first child node of the found node is returned if the given node has children and the first child is a value node. Get the value for a CDATA node. NULL is returned if the node is not a CDATA element. Get the value for a custom node. NULL is returned if the node (or its first child) is not a custom value node. Get the name for an element node. NULL is returned if the node is not an element node. Get the first child of an element node. NULL is returned if the node is not an element node or if the node has no children. Get the integer value from the specified node or its first child. 0 is returned if the node (or its first child) is not an integer value node. Get the last child of an element node. Get the next node for the current parent. NULL is returned if this is the last child for the current parent. Get an opaque string value for a node or its first child. NULL is returned if the node (or its first child) is not an opaque value node. NULL is returned for a root node. Get the previous node for the current parent. NULL is returned if this is the first child for the current parent. Get the real value for a node or its first child. 0.0 is returned if the node (or its first child) is not a real value node. Get the current reference (use) count for a node. The initial reference count of new nodes is 1. Use the mxmlRetain and mxmlRelease functions to increment and decrement a node's reference count. .
Get the text value for a node or its first child. NULL is returned if the node (or its first child) is not a text node. The "whitespace" argument can be NULL. Note: Text nodes consist of whitespace-delimited words. You will only get single words of text when reading an XML file with MXML_TEXT nodes. If you want the entire string between elements in the XML file, you MUST read the XML file with MXML_OPAQUE nodes and get the resulting strings using the mxmlGetOpaque function instead. MXML_IGNORE is returned if "node" is NULL. Get the user data pointer for a node. Return the next node in the index. You should call mxmlIndexReset prior to using this function to get the first node in the index. Nodes are returned in the sorted order of the index. Find the next matching node. You should call mxmlIndexReset prior to using this function for the first time with a particular set of "element" and "value" strings. Passing NULL for both "element" and "value" is equivalent to calling mxmlIndexEnum. Get the number of nodes in an index. The index will contain all nodes that contain the named element and/or attribute. If both "element" and "attr" are NULL, then the index will contain a sorted list of the elements in the node tree. Nodes are sorted by element name and optionally by attribute value if the "attr" argument is not NULL. Reset the enumeration/find pointer in the index and return the first node in the index. This function should be called prior to using mxmlIndexEnum or mxmlIndexFind for the first time. Load a file descriptor into an XML node tree. First node or NULL if the file could not be read. The nodes in the specified file are added to the specified top node. If no top node is provided, the XML file MUST be well-formed with a single parent node like <?xml> for the entire file. The callback function returns the value type that should be used for child nodes. The constants MXML_INTEGER_CALLBACK, MXML_OPAQUE_CALLBACK, MXML_REAL_CALLBACK, and MXML_TEXT_CALLBACK are defined for loading child (data) nodes of the specified type. Note: The most common programming error when using the Mini-XML library is to load an XML file using the MXML_TEXT_CALLBACK, which returns inline text as a series of whitespace-delimited words, instead of using the MXML_OPAQUE_CALLBACK which returns the inline text as a single string (including whitespace). Load a file into an XML node tree. Load a string into an XML node tree. First node or NULL if the string has errors. The nodes in the specified string are added to the specified top node. If no top node is provided, the XML string MUST be well-formed with a single parent node like <?xml> for the entire string. The callback function returns the value type that should be used for child nodes. The constants MXML_INTEGER_CALLBACK, MXML_OPAQUE_CALLBACK, MXML_REAL_CALLBACK, and MXML_TEXT_CALLBACK are defined for loading child (data) nodes of the specified type. Create a new CDATA node. The new CDATA node is added to the end of the specified parent's child list. The constant MXML_NO_PARENT can be used to specify that the new CDATA node has no parent. The data string must be nul-terminated and is copied into the new node. CDATA nodes currently use the MXML_ELEMENT type. Create a new custom data node. The new custom node is added to the end of the specified parent's child list. The constant MXML_NO_PARENT can be used to specify that the new element node has no parent. NULL can be passed when the data in the node is not dynamically allocated or is separately managed. Create a new element node. The new element node is added to the end of the specified parent's child list. The constant MXML_NO_PARENT can be used to specify that the new element node has no parent. Create a new integer node. The new integer node is added to the end of the specified parent's child list. The constant MXML_NO_PARENT can be used to specify that the new integer node has no parent. Create a new opaque string. The new opaque string node is added to the end of the specified parent's child list. The constant MXML_NO_PARENT can be used to specify that the new opaque string node has no parent. The opaque string must be nul- terminated and is copied into the new node. Create a new formatted opaque string node. The new opaque string node is added to the end of the specified parent's child list. The constant MXML_NO_PARENT can be used to specify that the new opaque string node has no parent. The format string must be nul-terminated and is formatted into the new node. Create a new real number node. The new real number node is added to the end of the specified parent's child list. The constant MXML_NO_PARENT can be used to specify that the new real number node has no parent. Create a new text fragment node. The new text node is added to the end of the specified parent's child list. The constant MXML_NO_PARENT can be used to specify that the new text node has no parent. The whitespace parameter is used to specify whether leading whitespace is present before the node. The text string must be nul-terminated and is copied into the new node. Create a new formatted text fragment node. The new text node is added to the end of the specified parent's child list. The constant MXML_NO_PARENT can be used to specify that the new text node has no parent. The whitespace parameter is used to specify whether leading whitespace is present before the node. The format string must be nul-terminated and is formatted into the new node. Create a new XML document tree. The "version" argument specifies the version number to put in the ?xml element node. If NULL, version "1.0" is assumed. When the reference count reaches zero, the node (and any children) is deleted via mxmlDelete. Remove a node from its parent. This function does not free memory used by the node - use mxmlDelete for that. This function does nothing if the node has no parent. Load a file descriptor into an XML node tree using a SAX callback. The nodes in the specified file are added to the specified top node. If no top node is provided, the XML file MUST be well-formed with a single parent node like <?xml> for the entire file. The callback function returns the value type that should be used for child nodes. The constants MXML_INTEGER_CALLBACK, MXML_OPAQUE_CALLBACK, MXML_REAL_CALLBACK, and MXML_TEXT_CALLBACK are defined for loading child nodes of the specified type. The SAX callback must call mxmlRetain for any nodes that need to be kept for later use. Otherwise, nodes are deleted when the parent node is closed or after each data, comment, CDATA, or directive node. Load a file into an XML node tree using a SAX callback. Load a string into an XML node tree using a SAX callback. The nodes in the specified string are added to the specified top node. If no top node is provided, the XML string MUST be well-formed with a single parent node like <?xml> for the entire string. The callback function returns the value type that should be used for child nodes. The constants MXML_INTEGER_CALLBACK, MXML_OPAQUE_CALLBACK, MXML_REAL_CALLBACK, and MXML_TEXT_CALLBACK are defined for loading child nodes of the specified type. Save an XML tree to an allocated string. This function returns a pointer to a string containing the textual representation of the XML node tree. The string should be freed using the free() function when you are done with it. NULL is returned if the node would produce an empty string or if the string cannot be allocated. The callback argument specifies a function that returns a whitespace string or NULL before and after each element. If MXML_NO_CALLBACK is specified, whitespace will only be added before MXML_TEXT nodes with leading whitespace and before attribute names inside opening element tags. Save an XML tree to a file descriptor. Save an XML tree to a file. Save an XML node tree to a string. This function returns the total number of bytes that would be required for the string but only copies (bufsize - 1) characters into the specified buffer. Set the element name of a CDATA node. The node is not changed if it (or its first child) is not a CDATA element node. Set the data and destructor of a custom data node. The node is not changed if it (or its first child) is not a custom node. Set the handling functions for custom data. The load function accepts a node pointer and a data string and must return 0 on success and non-zero on error. The save function accepts a node pointer and must return a malloc'd string on success and NULL on error. Set the name of an element node. The node is not changed if it is not an element node. Set the error message callback. Set the value of an integer node. The node is not changed if it (or its first child) is not an integer node. Set the value of an opaque node. The node is not changed if it (or its first child) is not an opaque node. Set the value of an opaque string node to a formatted string. Set the value of a real number node. The node is not changed if it (or its first child) is not a real number node. Set the value of a text node. The node is not changed if it (or its first child) is not a text node. Set the value of a text node to a formatted string. Set the user data pointer for a node. Set the wrap margin when saving XML data. Wrapping is disabled when "column" is 0. Walk to the next logical node in the tree. The descend argument controls whether the first child is considered to be the next node. The top node argument constrains the walk to the node's children. Walk to the previous logical node in the tree. The descend argument controls whether the previous node's last child is considered to be the previous node. The top node argument constrains the walk to the node's children. Copyright © 1991-2019 by Michael R Sweet. All rights reserved.